Objectives: The current investigation was conducted to examine the anticancer effect of polyisoprenoids from Avicennia marina and Avicennia lanata leaves in WiDr cells. Selectivity index (SI), cell cycle inhibition, and apoptosis activity were evaluated. Materials and Methods: The anticancer activity of polyisoprenoids from A. marina and A. lanata leaves was determined by observing the activity of these compounds toward WiDr cells using the 3-(4,5-dimethyl-2-thiazolyl)-2,5-diphenyltetrazolium bromide assay. The SI was determined from the IC50 of the polyisoprenoid extract in normal cells (Vero) versus cancer cells (WiDr). 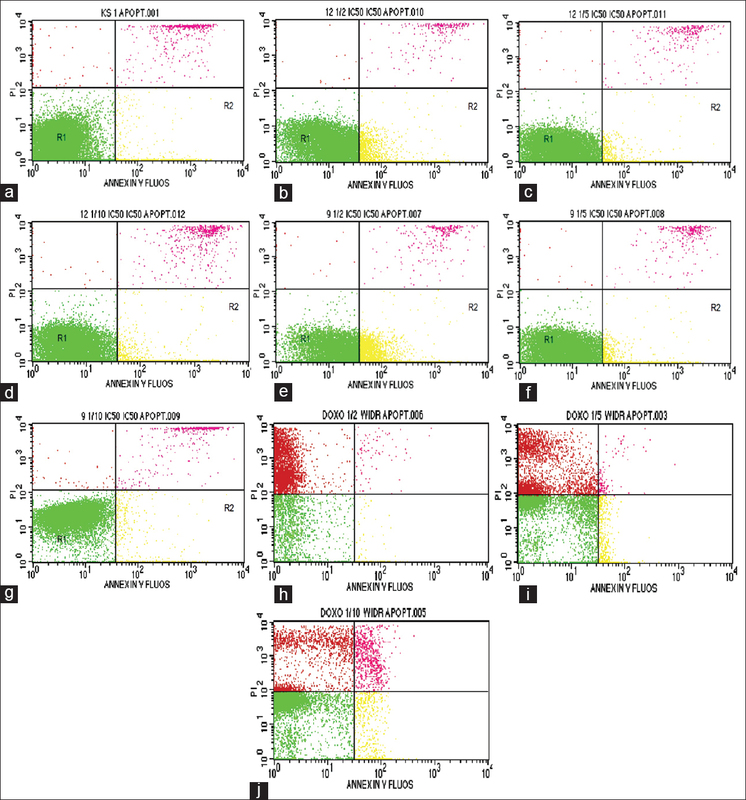 Inhibited cell cycle and increased apoptosis were analyzed by flow cytometry. Results: Polyisoprenoid extract from A. marina and A. lanata leaves exhibited anticancer activity against WiDr cells with an IC50 of 154.987 μg/mL and 305.928 μg/mL, respectively. The polyisoprenoid extract from A. marina leaves had an SI value of 5.195 (>3) for categorization as exceptionally selective. Cell cycle analysis revealed that the inhibition occurred in the G0–G1 phase and apoptosis occurred in the early-apoptosis development. Conclusion: Polyisoprenoids from A. marina and A. lanata leaves can be used as anticancer agents against WiDr colon cancer cells. The mechanisms that underlie anticancer activity of the extract were due to by inhibiting of cell cycle and inducing of apoptosis. Abbreviations used: DMSO: Dimethylsulfoxide, MTT: 3-(4,5-dimethyl-2-thiazolyl)-2,5-diphenyltetrazolium bromide, PBS: Phosphate buffer saline, SDS: Sodium dodecyl sulfate. The present study confirmed that polyisoprenoids from A. marina and A. lanata leaves promise anticancer agents. Cancer is the second prominent cause of mortality in the world and is conscientious for 8.8 million demises in 2015. Almost one in six deaths globally is caused by cancer. About 70% of cancer deaths occur in countries with low- and middle-economic levels. Cancer is characterized by unbridled cell growth espoused by the incursion of surrounding tissue and the propagation of malignant cells., Cancer cells are recognized to lose the ability to downregulate the cell cycle, leading to their incessant proliferation. Apoptosis (program cell death) regulates the normal equilibrium of cellular existence and mortality which involve pro- and anti-apoptosis protein. Overexpression of anti-apoptosis protein in the human cell is linked to cancer development, resistance to treatment, and tumor progression. Primary cancer treatments have combined chemotherapy agents and ionizing radiation to remove most of the tumor mass. However, these treatments bring the incidence of cancer relapse and even destroy the healthy cells. The use of conventional anticancer drugs has led to the development of drug resistance towards cancer cells. Therefore, it needs to find the potential drug for anticancer from alternative source including natural product. Avicennia marina and Avicennia lanata belonging to family Acanthaceae are known as either the mangrove plants which are considerably distributed in South Asia and Southeast Asia. This plant in many countries has been used as a traditional medicament for the healing of several ailments as well as rheumatism, smallpox, and ulcers. It has been described that these plants possess various pharmacological activities including cytotoxicity and anticancer. A. marina and A. lanata contain high yield of triterpenoid and phytosterol (isoprenoids) compounds., Recently, it has been identified three type of triterpenoids, e.g., lupanes, oleanane, and ursane, as well as polyisoprenoids, which forms these mangrove plants.,, Polyisoprenoids displayed some biological activities such as lowering cholesterol, anti-inflammation, and antiulcer., However, less information is available about the anticancer activity of polyisoprenoids from A. marina and A. lanata. Hence, the present study purposed to probe its anticancer activity. The activity of this extract on the cell cycle and apoptosis was investigated. The outcomes of this study will help characterize the anticancer properties of polyisoprenoids from A. marina and A. lanata. Fresh leaves of A. marina and A. lanata were collected from Lubuk Kertang village, Langkat regency, Sumatera Utara province, Indonesia. A. marina and A. lanata were identified in Oceanography, Indonesian Institute of Sciences, Jakarta Utara. Roswell Park Memorial Institute-1640 (RPMI-1640) and M199 were obtained from Gibco (USA), the annexin-V and propidium iodide kits were from BioLegend (USA), dimethylsulfoxide (DMSO), 3-(4,5-dimethylimidazole-2-yl)-2,5-diphenyl tetrazolium bromide (MTT), phosphate buffer saline (PBS), and sodium dodecyl sulfate (SDS) were purchased from Sigma (USA). Chloroform, methanol, hexane, ethanol, HCl, and KOH were obtained from Merck (Germany). Colon cancer cell line (WiDr) and normal cell (Vero) were procured from Paracytology Laboratory, Faculty of Medicine, Gadjah Mada University, and nurtured in RPMI-1640 and M199 with 10% FBS, antibiotic mixture (penicillin streptomycin 2%) and antifungal (amphotericin B 0.5%) under defined conditions of temperature at 37°C, and 5% CO2. The procedure for the extraction of polyisoprenoids was performed as beforehand represented.,, The A. marina and A. lanata leaves were dried at 60°C–75°C for 1–2 days. The dried leaves were pounded into a fine powder (500 g) and were submerged in an admixture of chloroform: methanol (2:1, v/v) solvent for 2 days. The total lipid extract of the leaves was saponified at 65°C for 1 day in 86% ethanol comprising 2 M KOH. The nonsaponifiable lipids of leaves were dissolved with hexane, and this organic solvent was dried up and redissolved in hexane. Cell cycle inhibition was assessed as delineated beforehand. Briefly, WiDr cells were plated in a 6-well microplate at a density of 5 × 105 (approximately 500,000) cells/well and then were hatched for overnight to obtain good growth. The next day, the cells were evaluated with various contents of polyisoprenoid extract from A. marina and A. lanata leaves (1/2, 1/5, and 1/10 IC50 were carried out as previously reported) and were incubated for 24 h. Doxorubicin was used as a positive control. Subsequent to incubation, the samples were displaced inside 15-mL conical tubes, and the microplates were washed with PBS, which was then collected and added to the same conical tubes. Afterward, 250 μL of trypsin was appended to the microplates, which were then hatched for 3 min at 37°C. After that, 1 mL of culture media was added to the microplates, and then the media were collected and added to the same conical tubes. Following, 1 mL of PBS was added to the microplates, and then, the PBS washes were collected and added to the same conical tubes, followed by centrifugation at 600 rpm for 5 min and displacement of the liquids. After that, the pellets were redissolved in 1 mL of PBS, followed by transfer to microtubes and centrifugation at 2000 rpm for 3 min. Next, 500 μL of 70% ethanol was appended and incubated for 30 min. After incubation, the cells were resuspended in propidium iodide. The cell cycle distribution was observed using a flow cytometer (FACSCalibur). Apoptosis detection was performed as described previously. Briefly, WiDr cells were grown in a 6-well microplate at a density of 5 × 105 cells/wells and hatched for 1 day to obtain good growth. The following day, cells were employed with various concentrations of polyisoprenoid extract from A. marina and A. lanata leaves (1/2, 1/5, and 1/10 IC50) and incubated for 24 h. Doxorubicin was used as a positive control. Subsequent to incubation, the samples were displaced inside 15-mL conical tubes, the microplates were cleansed with PBS, and then the PBS washes were collected and added to the same conical tubes. Next, 250 μL of trypsin was appended to the microplates, which were nurtured for 3 min at 37°C. After that, 1 mL of culture media was appended to the microplates, and then, the media were collected and added to the same conical tubes. Next, the cells in the microplates were resuspended in 1 mL PBS; the PBS washes were collected and added to the same conical tubes, followed by centrifugation at 600 rpm for 5 min and removal of the supernatants. The pellets were dissolved in 1 mL of PBS and were displaced inside microtubes and centrifuged at 2000 rpm for 3 min. Next, 100 μL of annexin-V buffer was added to the cells, partaken by the addition of 5 μL each of annexin-V and propidium iodide and incubation for 10 min. After preparation, 300 μL of annexin-V buffer was appended. Apoptosis was observed using a flow cytometer (FACSCalibur). Data were represented as the means ± standard deviation from at least three separation experimentations. The IC50 values were calculated from the linear regression equations of the dose–response curve for each test using probit analysis with SPSS 23 software (IBM Corporation, Armonk, NY, United States of America). Cytotoxic activity was carried out using the MTT method by measuring the intensity of the color (colorimetric) due to the metabolism of a substrate by lively cells into a colored product. In the present investigation, the MTT salt was used. This salt was involved in the action of the enzyme dehydrogenase. MTT is decreased to formazan by succinate-tetrazolium reduction system present in cell respiration pathways in the mitochondria active in living cells. What the viability effect of polyisoprenoid extract from A. marina and A. lanata leaves against WiDr cells was exhibited in a dose-dependent manner in which a low content of extract (31.25 μg/mL) generated in a high percentage of viability (80.020% and 93.597%). Conversely, the highest level (500 μg/mL) revealed a low rate of sustainability (4.123% and 15.428%). As shown in [Table 1], the IC50 value of polyisoprenoid extract from A. marina and A. lanata leaves was 154.987 and 305.928 μg/mL, respectively, which is lower than that of doxorubicin (5.445 μg/mL). The results indicate that the polyisoprenoid extract from A. marina and A. lanata leaves was less active as an anticancer agent because the extract is considered active if IC50≤ 100 μg/mL., However, it could still be developed as an anticancer agent because it is deemed to be inactive if IC50> 500 μg/mL. It has been previously reported that the methanol and aqueous extracts from A. marina have cytotoxicity effects on HL-60 and NCI-H23 cells with efficient IC50 values and negligible toxicity effects on normal cells (HEK-293T). A study by Reddy and Ratna demonstrated that the methanolic part of A. marina leaves showed antiproliferative activity against MCF-7cell line in a dose-dependent manner. The activity of polyisoprenoid extract on the cell cycle of WiDr cells was analyzed using flow cytometry. Cessation of the cell cycle at the G0–Gl phase allows the promotion of apoptosis. Discontinuation of the cell cycle in the Gl phase will provide an opportunity to the damaged cells to be recognized and continue the process of apoptosis. The DNA content inside of the cell was distributed as the G0/G1, S, or G2/M phase of the cell cycle. 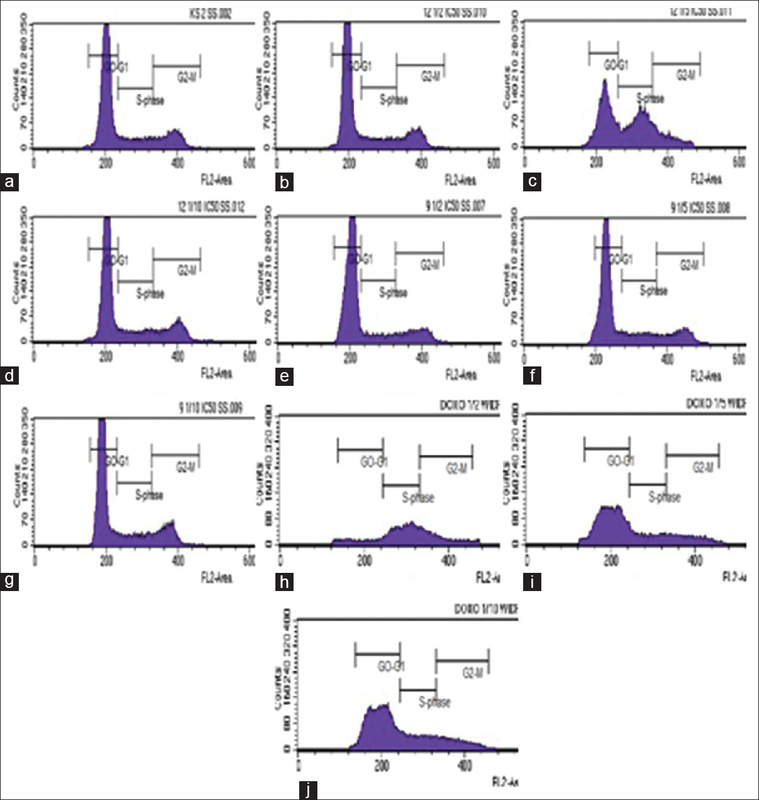 As shown in [Figure 2], the percentages of G0–G1 stage profiles for WiDr cells treated with polyisoprenoid extract from A. marina and A. lanata leaves at 1/2, 1/5, and 1/10 IC50 were 72.43%, 44.26%, 67.45% and 70.34%, 66.84%, 70.11%, respectively. The accumulation rates of cells in S phase after treatment with each concentration of polyisoprenoid extract from A. marina and A. lanata leaves were 11.94%, 40.37%, 13.80% and 10.27%, 14.05%, 13.47%, respectively. Meanwhile, the percentages of G2–M phase profiles for WiDr cells treated with polyisoprenoid extract from A. marina and A. lanata leaves at 1/2, 1/5, 1/10 IC50 were 15.60%, 15.67%, 18.79% and 15.66%, 17.01%, 16.65%, respectively. The percentages of control cells (as shown in [Table 2]) in G0–G1 phase, S phase, and G2–M phase were 69.52%, 12.81% and 17.63%, respectively. These results indicated that polyisoprenoid extract from A. marina and A. lanata leaves constrained the growth of cells in the G0–G1 phase. 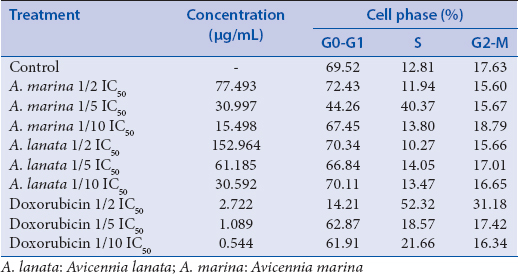 As presented in [Figure 3], the percentage values of cells undergoing early apoptosis (R2) after treatment with the polyisoprenoid extract from A. marina and A. lanata leaves at 1/2, 1/5, 1/10 IC50 were 12.85%, 4.83%, 4.75% and 31.77%, 5.80%, 2.02%, respectively. In contrast, the proportion values of cells undergoing late apoptosis/early necrosis (R3) and late necrosis (R4) after treatment with each concentration of polyisoprenoid extract from A. marina and A. lanata leaves were 1.24%, 1.38%, 2.92% and 1.27%, 1.60%, 2.62% and 0.09%, 0.11%, 0.11% and 0.10%, 0.12%, 0.36%, respectively. The polyisoprenoid extract from A. marina and A. lanata leaves demonstrated positive activity in apoptosis using annexin-V. According to the previous study, a fraction of A. marina was found killed MDA-MB 231 breast cancer cells through apoptosis mechanism via p53 and Bcl-2 genes, which induces to leading DNA fragmentation. The principle of annexin-V labeling is the staining of PS on the outer cell membrane. Early apoptosis cells express PS on the external plasma membrane. PS can be dyed by annexin-V labeling. Cells are subjected to late apoptosis and necrosis will bereave the integrity of the cell membrane and become permeable to an annexin-V dye. 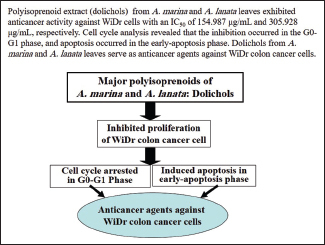 Polyisoprenoid extracts from the leaves of A. marina and A. lanata exhibited anticancer activity against WiDr colon cancer cells. The polyisoprenoid extract from A. marina leaves had a SI value of 5.195 (>3) for classification as highly selective. This extract had a mechanism of inhibition of cell cycle at the G0–G1 stage, and apoptosis analysis occurred in the early-apoptosis phase in WiDr cells. This finding might emphasize the potency of polyisoprenoid extract as an anticancer agent against WiDr colon cancer cells. Nevertheless, a farther inquiry is still required to define the detailed mechanism of the anticancer activity of polyisoprenoid extract. The authors thank to Directorate General of Research and Community Service, the Ministry of Research, Technology and Higher Education of the Republic of Indonesia and University of Sumatera Utara. This work was funded by Directorate General of Research and Community Service, the Ministry of Research, Technology and Higher Education of the Republic of Indonesia through Penelitian Terapan Unggulan Perguruan Tinggi 2017 (No. 003/SP2H/LT/DRPM/IV/2017). World Health Organization. Media Centre. Cancer. World Health Organization; 2017. Available from: http://www.who.int/mediacentre/factsheets/fs297/en/, [Last accessed on 2017 Dec 18]. Saputra K, Maat S, Soedoko R. Biol. Therapy for Cancer. Surabaya: Airlangga University Press; 2000. p. 1, 5-10, 50. Corwin EJ. Pocketbook of pathophysiology. Jakarta: EGC Medical Book Publishers; 2001. p. 356. Siao AC, Hou CW, Kao YH, Jeng KC. Effect of sesamin on apoptosis and cell cycle arrest in human breast cancer mcf-7 cells. Asian Pac J Cancer Prev 2015;16:3779-83. Bai L, Wang S. Targeting apoptosis pathways for new cancer therapeutics. Annu Rev Med 2014;65:139-55. Globocan. Colorectal Cancer. Estimated Incidence, Mortality and Prevalence Worldwide in 2012; 2012a. Available from: http://www.globocan.iarc.fr/Pages/fact_sheets_cancer.aspx. [Last accessed on 2017 Dec 18]. Globocan. Indonesia. Estimated Cancer Incidence, Mortality and Prevalence Worldwide in 2012; 2012b. Available from: http://www.globocan.iarc.fr/Pages/fact_sheets_population.aspx. [Last accessed on 2017 Dec 18]. Arnold M, Sierra MS, Laversanne M, Soerjomataram I, Jemal A, Bray F. Global patterns and trends in colorectal cancer incidence and mortality. BMJ 2016;66:1-9. Bandaranayake WM. Bioactive compounds and chemical constituents of mangrove plants. Wetl Ecol Manag 2002;10:421-52. Das G, Gouda S, Mohanta YK, Patra JK. Mangrove plants: A potential source for anticancer drugs. Indian J Geo Mar Sci 2015;44:666-72. Koch BP, Rullkotter J, Lara RJ. Evaluation of triterpenoids and sterols as organic matter biomarkers in a mangrove ecosystem in Northern Brazil. Wetl Ecol Manag 2003;11:257-63. Basyuni M, Baba S, Takara K, Iwasaki H, Oku H. Isoprenoids of Okinawan mangroves as lipid input into estuarine ecosystem. J Oceanogr 2007;63:601-8. Basyuni M, Putri LA, Julayha J, Nurainun H, Oku H. Non-saponifiable lipid composition of four salt-secretor and non-secretor mangrove species from North Sumatera, Indonesia. Makara J Sci 2012;16:89-94. Basyuni M, Sagami H, Baba S, Iwasaki H, Oku H. Diversity of polyisoprenoids in ten Okinawan mangroves. Dendrobiology 2016;75:167-75. Basyuni M, Sagami H, Baba S, Oku H. Distribution, occurrence, and cluster analysis of new polyprenyl acetones and other polyisoprenoids from North Sumatran mangroves. Dendrobiology 2017;78:18-31. Murakami M, Oketani K, Fujisaki H, Wakabayashi T, Inai Y, Abe S, et al. Effect of synthetic acyclic polyisoprenoids on the cold-restraint stress induced gastric ulcer in rats. Jpn J Pharmacol 1983;33:549-56. Pronin AV, Danilov LL, Narovlyansky AN, Sanin AV. Plant polyisoprenoids and control of cholesterol level. Arch Immunol Ther Exp (Warsz) 2014;62:31-9. Sagami H, Kurisaki A, Ogura K, Chojnacki T. Separation of dolichol from dehydrodolichol by a simple two-plate thin-layer chromatography. J Lipid Res 1992;33:1857-61. Basyuni M, Wati R, Sagami H, Sumardi Baba S, Oku H. Diversity and abundance of polyisoprenoid composition in coastal plant species from North Sumatera, Indonesia. Biodiversitas 2018;19:1-11. Kupcsik L, Martin JS. Mammalian Cell Viability: Methods and Protocols. New York: Humana Press; 2011. p. 13-8. Cancer Chemoprevention Research Centre. The Protocol of Cytotoxic Analysis using MTT Assay. Yogyakarta: CCRC; 2013. p. 1-8. Weerapreeyakul N, Nonpunya A, Barusrux S, Thitimetharoch T, Sripanidkulchai B. Evaluation of the anticancer potential of six herbs against a hepatoma cell line. Chin Med 2012;7:15. 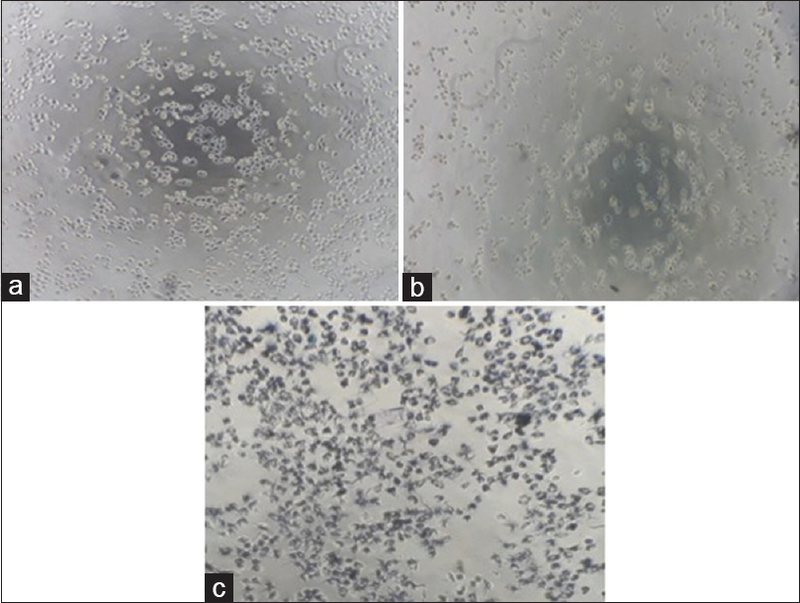 Hostanska K, Nisslein T, Freudenstein J, Reichling J, Saller R. Evaluation of cell death caused by triterpene glycosides and phenolic substances from Cimicifuga racemosa extract in human MCF-7 breast cancer cells. Biol Pharm Bull 2004;27:1970-5. Swantara IM, Rita WS, Hernindy RA. Isolation and phytochemical test of anticancer isolate of sponge Hyrtios erecta. JHSM UNUD J 2017;1:16-20. Kamuhabwa A, Nshimo C, de Witte P. Cytotoxicity of some medicinal plant extracts used in Tanzanian traditional medicine. J Ethnopharmacol 2000;70:143-9. Ueda JY, Tezuka Y, Banskota AH, Le Tran Q, Tran QK, Harimaya Y, et al. Antiproliferative activity of Vietnamese medicinal plants. Biol Pharm Bull 2002;25:753-60. Machana S, Weerapreeyakul N, Barusrux S, Nonpunya A, Sripanidkulchai B, Thitimetharoch T, et al. Cytotoxic and apoptotic effects of six herbal plants against the human hepatocarcinoma (HepG2) cell line. Chin Med 2011;6:39. Sukhramani PS, Patel PM. Biological screening of Avicennia marina for anticancer activity. Der Pharm Sinica 2013;4:125-30. Reddy A, Ratna GJ. Evaluation of in vitro anticancer activity of selected mangrove plant extracts against MCF7 cell line. Int J Recent Sci Res 2016;7:12315-8. Budityastomo H. The Influence of Administration of Dayak garlic (Eleutherine palmifolia L, Merr) Extract Ethanolic Fraction to the Expression Level Cycline-e Cancerous Cells of Uterine Cervix Hela (HPV high-risk type). Thesis. Faculty of Medicine. Surakarta: Sebelas Maret University Press; 2010. p. 58. Nguyen PT, Bui TT, Chau ND, Bui HT, Kim EJ, Kang HK, et al. In vitro evaluation of the antioxidant and cytotoxic activities of constituents of the mangrove Lumnitzera racemosa willd. Arch Pharm Res 2015;38:446-55. Palozza P, Serini S, Maggiano N, Angelini M, Boninsegna A, Di Nicuolo F, et al. Induction of cell cycle arrest and apoptosis in human colon adenocarcinoma cell lines by beta-carotene through down-regulation of cyclin A and Bcl-2 family proteins. Carcinogenesis 2002;23:11-8. Niranjana R, Gayathri R, Mol SN, Sugawara T, Hirata T, Miyashita K, et al. Carotenoids modulate the hallmarks of cancer cells. J Funct Foods 2015;18:968-85. Upadhyaya KR, Radha KS, Madhyastha HK. Cell cycle regulation and induction of apoptosis by beta-carotene in U937 and HL-60 leukemia cells. J Biochem Mol Biol 2007;40:1009-15. Demo SD, Masuda E, Rossi AB, Throndset BT, Gerard AL, Chan EH, et al. Quantitative measurement of mast cell degranulation using a novel flow cytometric annexin-V binding assay. Cytometry 1999;36:340-8. Brussaard CP, Marie D, Bratbak G. Flow cytometric detection of viruses. J Virol Methods 2000;85:175-82. Momtazi-Borojeni AA, Behbahani M, Sadeghi-Aliabadi H. Antiproliferative activity and apoptosis induction of crude extract and fractions of Avicennia marina. Iran J Basic Med Sci 2013;16:1203-8. Zimmermann M, Meyer N. Mammalian cell viability. In: Stoddart MJ, editor. Annexin v/7-aad Staining in Keratinocytes. Switzerland: Humana Press; 2011. p. 57-63. Petronelli A, Pannitteri G, Testa U. Triterpenoids as new promising anticancer drugs. Anticancer Drugs 2009;20:880-92. Ríos JL, Andújar I, Escandell JM, Giner RM, Recio MC. Cucurbitacins as inducers of cell death and a rich source of potential anticancer compounds. Curr Pharm Des 2012;18:1663-76.